I am loving this, one small technical question to anybody out there, Marcelo appears to put his finger actually on the fret rather then between them when he bars a chord, am I doing this wrong or is it simply an idiosyncrasy of Marcelos' ? Hello Walmerb! Technically speaking you want your finger to fall directly behind the fret, rather than evenly between the frets. This is what Marcello is doing, but it's so close that it appears that he is actually pushing ON the fret. Placing your finger directly behind the fret eliminates any possibility of the note going flat, which often happens if your fingers are in the middle of the two frets or even closer to the back fret. I hope this helps clear things up a bit! HAPPY JAMMING!! woodmaniac . I had the same question so I watched this video for a while and made a word file detailing it. Let me know if you want a copy. 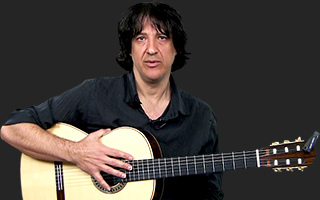 Hey Marcelo, Most lovely piece on the Flamenco Guitar. I Have a little confusion. When you are playing with the melody backing track, you seem to be playing Am-G-F-E with some added notes. But when your lesson begins, you are showing Dm-F-E in the fifth position. Pse resolve this for me! Ok! I think the video starts after the first 8 bars. right? why is the head phone you wer using? in order to to keep the sound of the track separated from the live guitar sound that you hear we used headphones so I could hear the track and play the rhythm at the same time in sync. When you get to the bottom of the chart go back to the top (you'll hear the improvised guitar solo), then again to the top and the "written mel" comes back. Then there's the percussion solo and after that it keeps repeating the 1st part till the end. Hi marcelo. Liked your first online lesson. I am still working on getting the cadence faster before I move on. hope to see you on your next online chat. later. The 1st time around the lead is a written mel, then improvised solo, then back to the written mel. Is the lead part improvised?